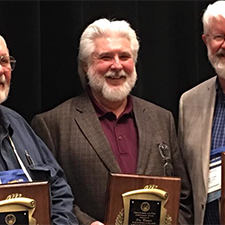 Dr. James Tidwell, chair of the division of aquaculture, received the lifetime achievement award during the Aquaculture 2019 Triennial meeting in New Orleans. The meeting is the largest aquaculture conference and trade show in the world, with nearly 4,000 attendees from more than 90 countries. Tidwell began his career at Kentucky State University in 1987 and was instrumental in starting the aquaculture graduate program in 1999. The program is currently one of the top-five aquaculture programs in the United States. Click here to learn about Kentucky State University’s aquaculture program.